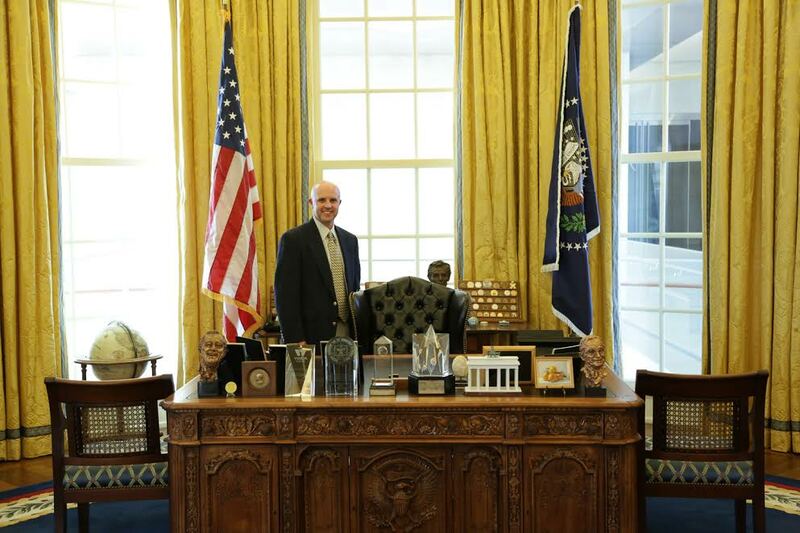 Todd in a replica of the Oval Office at the Clinton Presidential Library. ECW is pleased to welcome new author Todd Arrington. Todd is a career National Park Service historian, park ranger, and manager with more than twenty years of federal service. He has worked in four different historical parks and is currently the site manager of James A. Garfield National Historic Site in Mentor, Ohio. He credits his family’s move to Gettysburg, Pennsylvania, when he was ten years old with inspiring both his interest in history and his career choice. Arrington is a United States Army veteran and holds a Ph.D. in history from the University of Nebraska-Lincoln. His particular areas of study are the early Republican Party and the political history of the Civil War and Reconstruction eras. He has spoken to hundreds of groups, academic conferences, education and civic organizations, book clubs, libraries, Civil War round tables, and service organizations during his career. In 2016, he presented one of Gettysburg National Military Park’s annual winter lectures and presented a paper at the annual University of Mississippi Conference on the Civil War. He has been published on such subjects as the Civil War, the Republican Party, westward expansion, African American history, and more. Arrington is the author of the book The Medal of Honor at Gettysburg and is now at work on a study of the 1880 presidential election. Since moving to Ohio in 2009, he has taught history and humanities courses as an adjunct instructor at Lakeland Community College, Lake Erie College, and John Carroll University. 2014-16: Regular contributions on various subjects to We’re History blog, www.werehistory.org. Welcome! Best group in the world!! Thank you, Meg! Happy to be aboard and looking forward to contributing! Cool! I grew up in Mentor and visited the Garfield home many times. Looking forward to your stuff. Eric, thanks! And be sure to stop by and visit the next time you’re back in Mentor! Will do. Amazing how small a world it is. Had hoped to make it out there this summer to show the kids, with maybe a side stop at McKinley’s Library and Museum on the way home, but it looks like no dice. Probably this fall for a family event in Willoughby. Lawnfield is on the way.